16.Fog On The Tyne (cut) fade out after 3 mins. 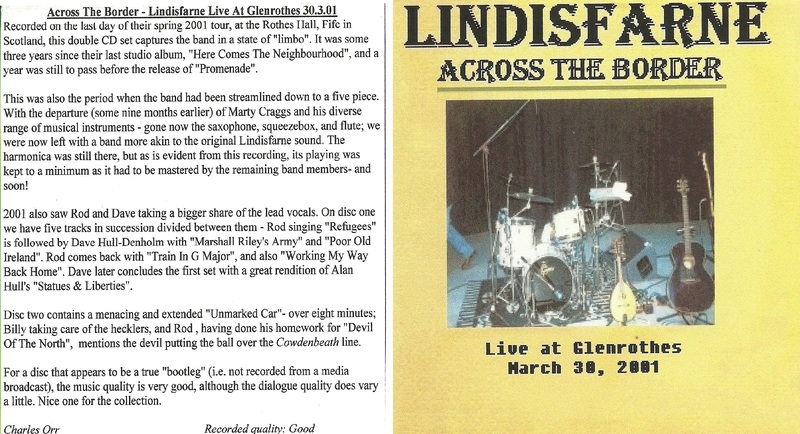 Recorded on the last day of their spring 2001 tour, at the Rothes Hall, Fife in Scotland, this double CD set captures the band in a state of "limbo". It was some three years since their last studio album, "Here Comes The Neighbourhood", and a year was still to pass before the release of "Promenade". This was also the period when the band had been streamlined down to a five piece. 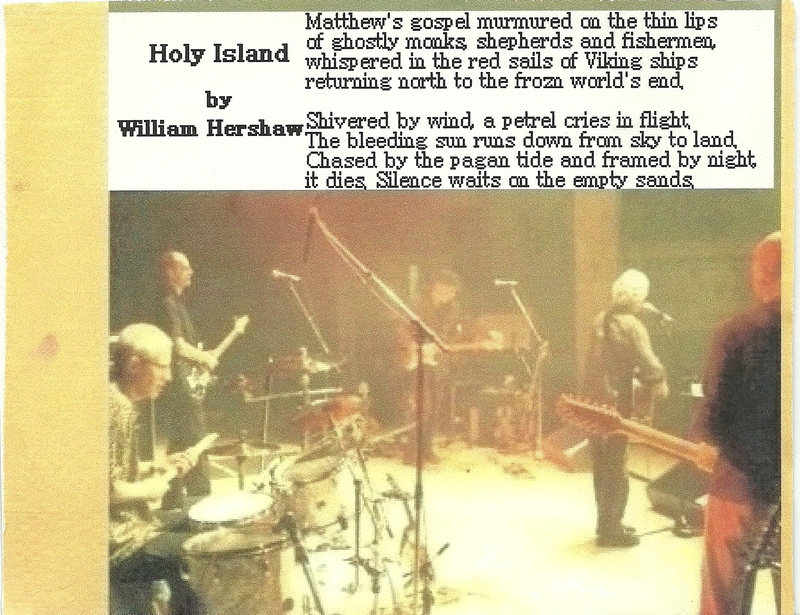 With the departure (some nine months earlier) of Marty Craggs and his diverse range of musical instruments - gone now the saxophone, squeezebox, and flute; we were now left with a band more akin to the original Lindisfarne sound. The harmonica was still there, but as is evident from this recording, its playing was kept to a minimum as it had to be mastered by the remaining band members- and soon! 2001 also saw Rod and Dave taking a bigger share of the lead vocals. 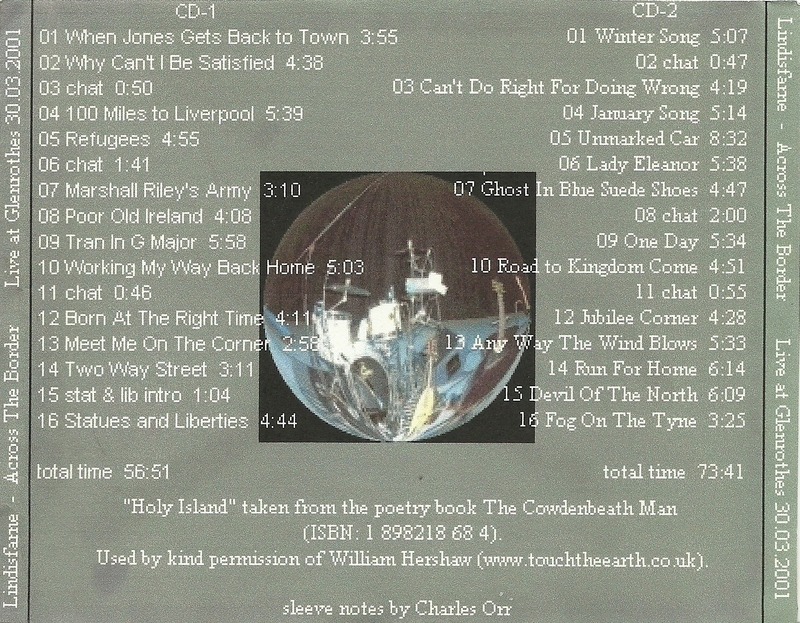 On disc one we have five tracks in succession divided between them - Rod singing "Refugees" is followed by Dave Hull-Denholm with "Marshall Riley's Army" and "Poor Old Ireland". Rod comes back with "Train In G Major", and also "Working My Way Back Home". Dave later concludes the first set with a great rendition of Alan Hull's "Statues & Liberties". Disc two contains a menacing and extended "Unmarked Car"- over eight minutes; Billy taking care of the hecklers, and Rod , having done his homework for "Devil Of The North", mentions the devil putting the ball over the Cowdenbeath line. For a disc that appears to be a true live show (i.e. not recorded from a media broadcast), the music quality is very good, although the dialogue quality does vary a little. Nice one for the collection. Images for all shows as well as full size images for this show.